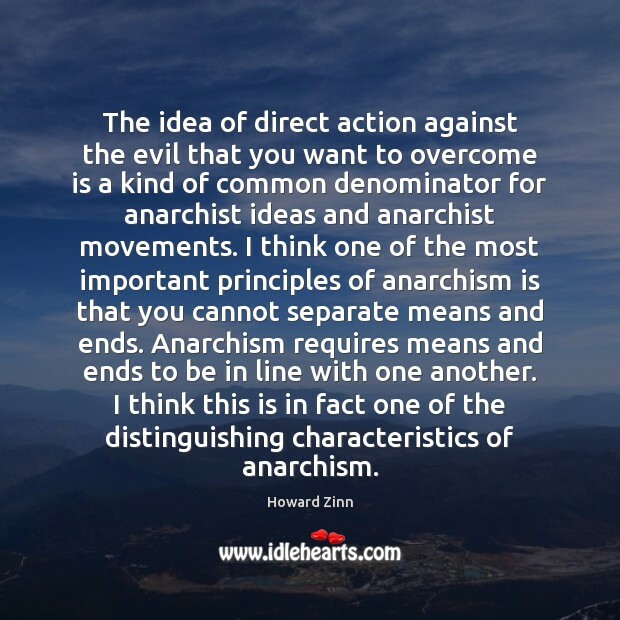 Quotations about Anarchism. Quotes to stimulate mind and drive action! Use the words and quote images to feed your brain inspiring things daily! 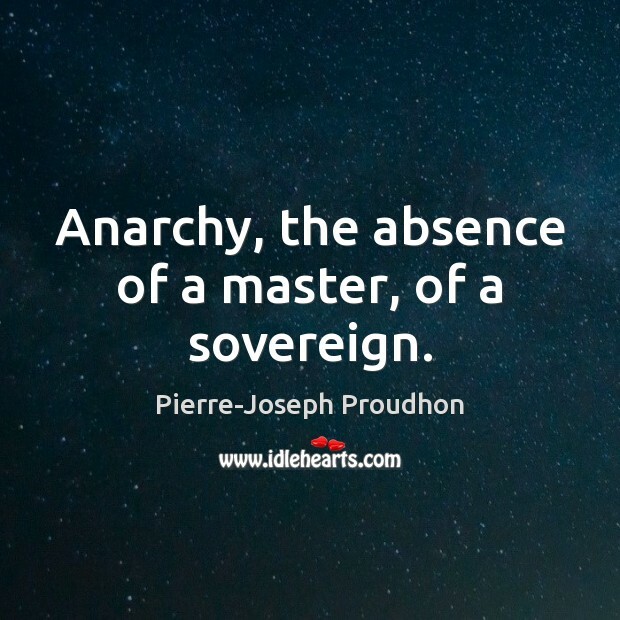 Anarchy, the absence of a master, of a sovereign. 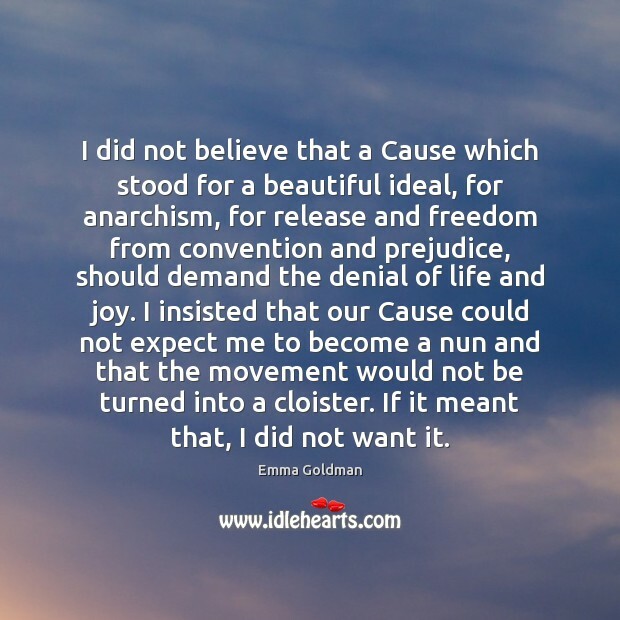 I did not believe that a Cause which stood for a beautiful ideal, for anarchism, for release and freedom from convention and prejudice, should demand the denial of life and joy. I insisted that our Cause could not expect me to become a nun and that the movement would not be turned into a cloister. If it meant that, I did not want it. 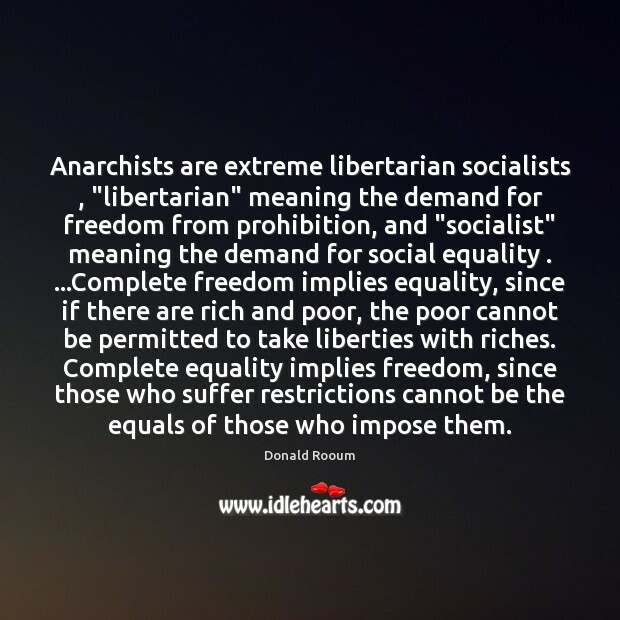 Anarchists are extreme libertarian socialists , "libertarian" meaning the demand for freedom from prohibition, and "socialist" meaning the demand for social equality . ...Complete freedom implies equality, since if there are rich and poor, the poor cannot be permitted to take liberties with riches. Complete equality implies freedom, since those who suffer restrictions cannot be the equals of those who impose them. 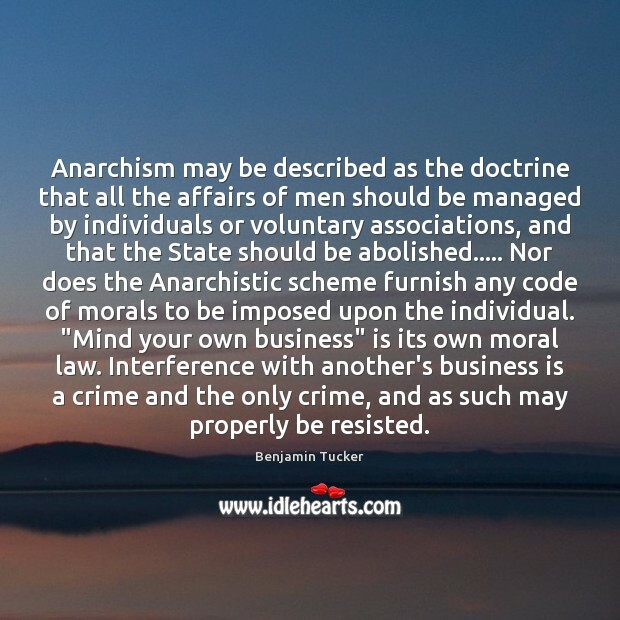 Anarchism may be described as the doctrine that all the affairs of men should be managed by individuals or voluntary associations, and that the State should be abolished..... Nor does the Anarchistic scheme furnish any code of morals to be imposed upon the individual. "Mind your own business" is its own moral law. Interference with another's business is a crime and the only crime, and as such may properly be resisted. 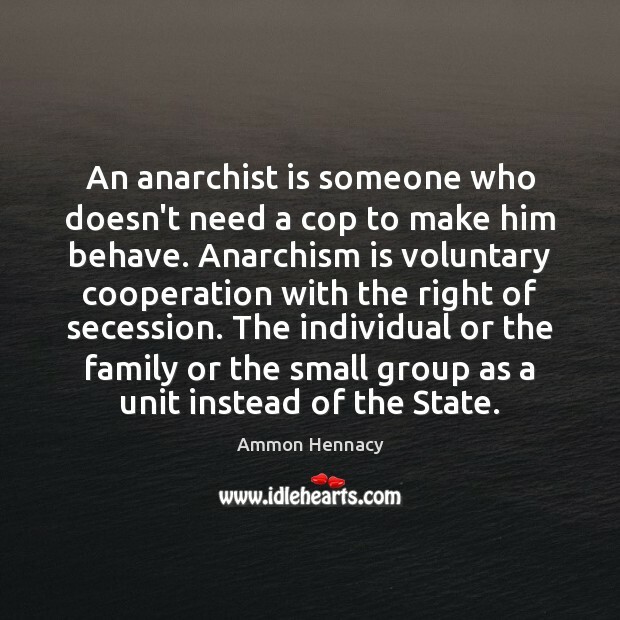 With subjectivity in philosophy, anarchism in politics goes hand in hand. 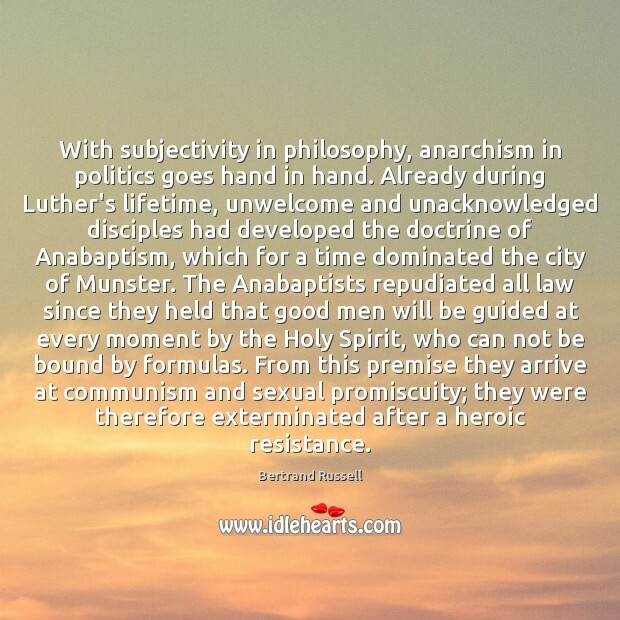 Already during Luther's lifetime, unwelcome and unacknowledged disciples had developed the doctrine of Anabaptism, which for a time dominated the city of Munster. The Anabaptists repudiated all law since they held that good men will be guided at every moment by the Holy Spirit, who can not be bound by formulas. From this premise they arrive at communism and sexual promiscuity; they were therefore exterminated after a heroic resistance. 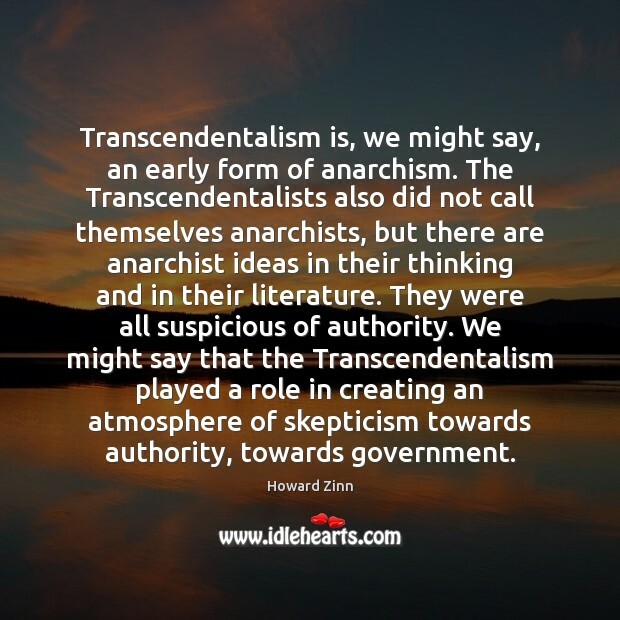 Transcendentalism is, we might say, an early form of anarchism. 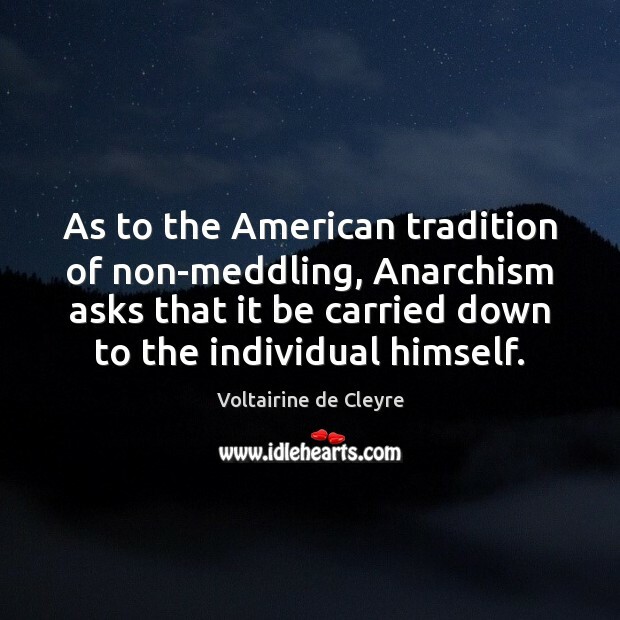 The Transcendentalists also did not call themselves anarchists, but there are anarchist ideas in their thinking and in their literature. They were all suspicious of authority. We might say that the Transcendentalism played a role in creating an atmosphere of skepticism towards authority, towards government. 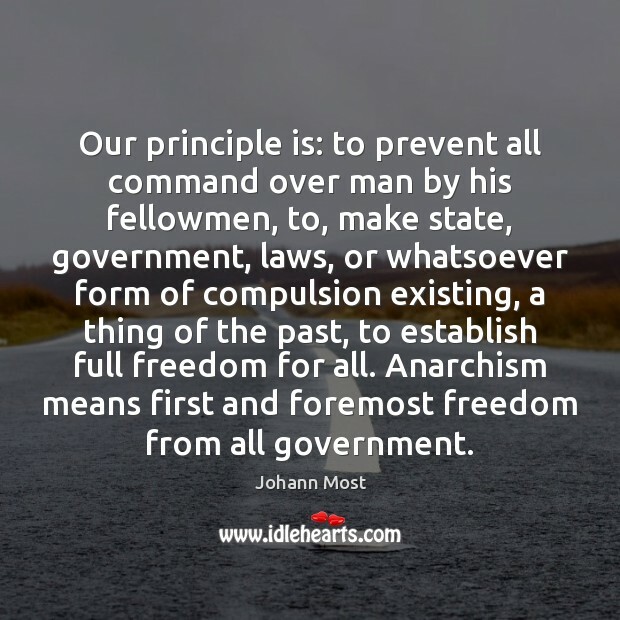 Our principle is: to prevent all command over man by his fellowmen, to, make state, government, laws, or whatsoever form of compulsion existing, a thing of the past, to establish full freedom for all. 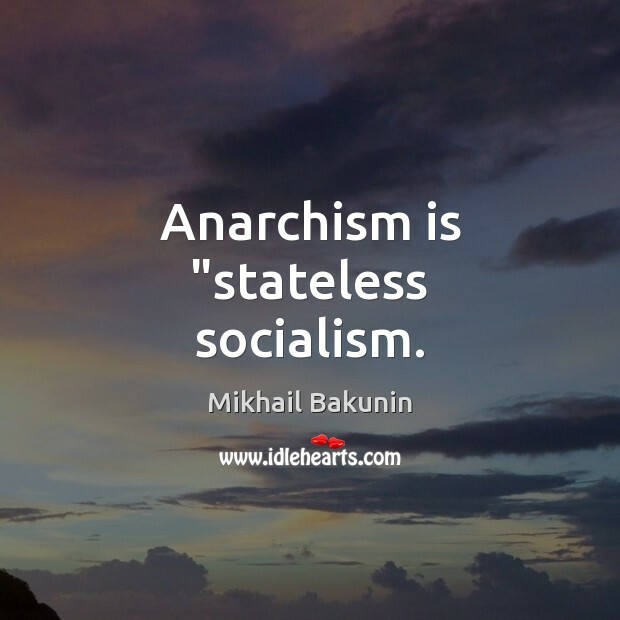 Anarchism means first and foremost freedom from all government. 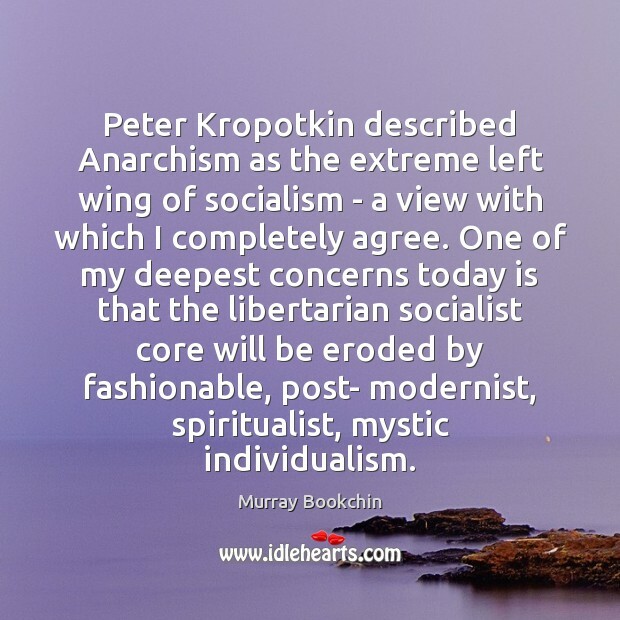 The emotions of the ignorant man are continuously kept at a pitch by the most blood-curdling stories about Anarchism. Not a thing too outrageous to be employed against this philosophy and its exponents. 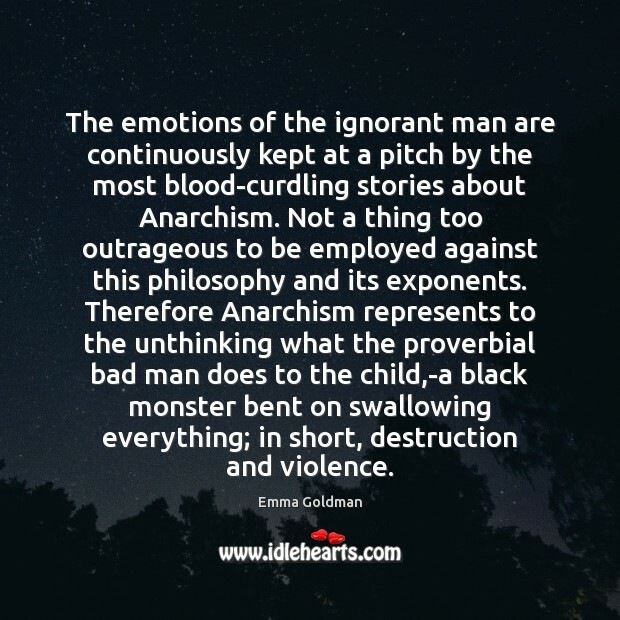 Therefore Anarchism represents to the unthinking what the proverbial bad man does to the child,-a black monster bent on swallowing everything; in short, destruction and violence. 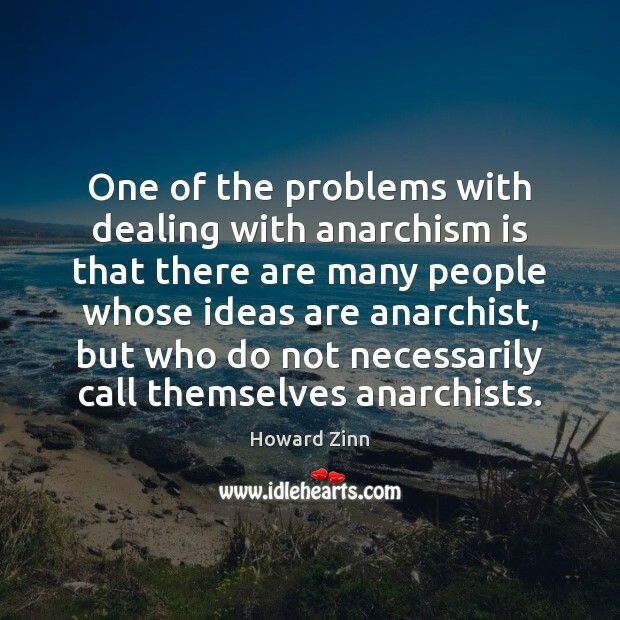 One of the problems with dealing with anarchism is that there are many people whose ideas are anarchist, but who do not necessarily call themselves anarchists. 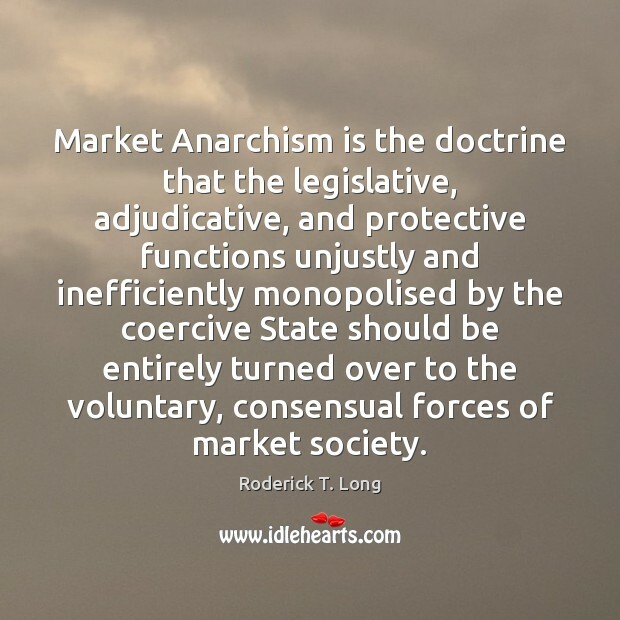 Market Anarchism is the doctrine that the legislative, adjudicative, and protective functions unjustly and inefficiently monopolised by the coercive State should be entirely turned over to the voluntary, consensual forces of market society. We have been civilized for a thousand millennia. We have histories of hundreds of those millennia. We have tried everything. Anarchism, in all its forms, with the rest. But I have not tried it. They say there is nothing new under any sun. 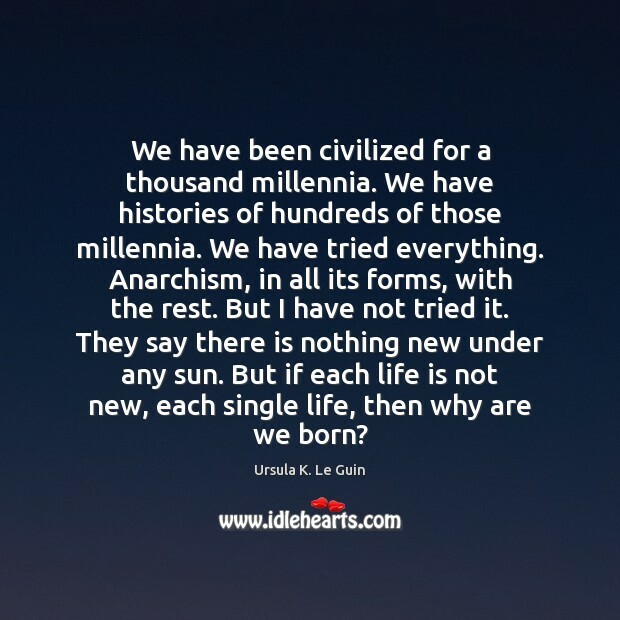 But if each life is not new, each single life, then why are we born? 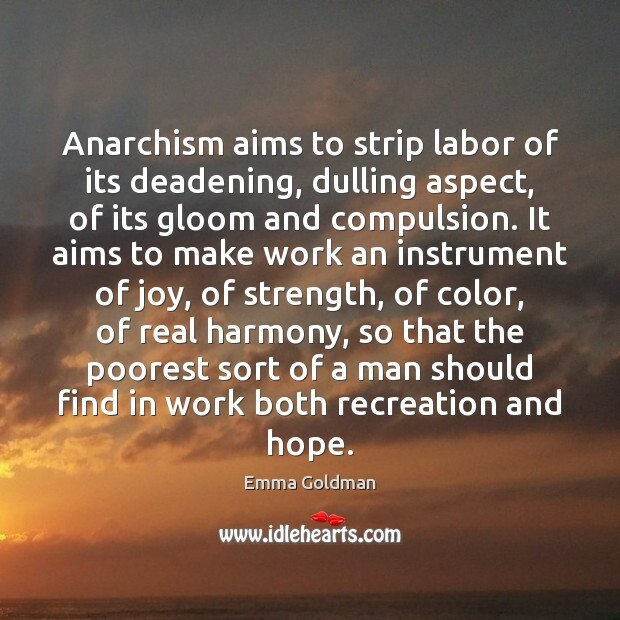 Anarchism aims to strip labor of its deadening, dulling aspect, of its gloom and compulsion. It aims to make work an instrument of joy, of strength, of color, of real harmony, so that the poorest sort of a man should find in work both recreation and hope.